So I know a lot of you are waiting for my clinic review -- I attended the Hilary Clayton clinic at Hilltop Farm in Colora, MD today. I have to admit it was hard to get up at 6am on Saturday to make the 2.5 hour drive, and as I shut off my alarm I thought for a brief moment that it would be nice to just stay in bed. Fortunately, my better judgement prevailed. It was AWSOME. HC is British (who knew? ), engaging, exceedingly clear in her teaching, and approachable. Sometimes the Big Names know they are Big. That is not the case here, and she seemed to truly enjoy interacting with us and helping us to understand. The only disappointment with this clinic is that I was unable to sign up for Day 2 due to scheduling issues. Day 1 focused on the neck and back, and HC offered us insights from her past and current research. Really great stuff. For now, I'll pass along a tidbit that was one of the more memorable images. We talked about the musculature of the horse -- the long muscles along the topline (and a shorter, more fibrous set of deep muscles surrounding the spine. We covered the abdominal muscles underneath the belly and stretching up and around the horse's underside. HC told us that the belly organs of the horse (intestines, liver, etc.) weigh hundreds of pounds. As the a horse trots, during the "airtime phase," the top back muscles tense, or as HC says, they "light up"; at the end of the moment of suspension, the organs are bouncing upward and their weight/force meets the top back muscles in their active, tense state. 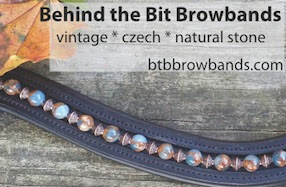 The organs bounce against the topline and they're driven down as the horse descends. And as the horse makes contact with the ground (the stance phase), the organs are close behind, and the abdominal muscles light up/activate. The organs then bounce against the abdominal muscles. So as the horse trots, his insides are bouncing around in this predictable way, pinging back and forth against the spine and abdomen. What are the implications of this? Well, for one it gives us a sense of which muscles are activated during the trot mechanics. We get a visceral sense of the horse's experience while trotting. HC states that our job is not to make the horse's back move more, but to stabilize the movement. This last point is the hardest to take in. I think she means that there's a lot of action going on already as the horse works--they're trying to control their own parts (limbs, organs, etc. 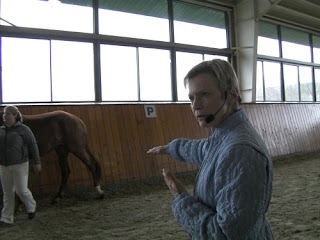 ), and we need to develop the musculature to help the horse control his own body, within his own rhythm. I can't get over the notion of the organs ping-ponging around inside. HC spoke of how the spine bends and twists -- yes, twists -- and the muscles that support these motions. She showed us a picture of the half-pass, and noted that during this bend, the horse is not just wrapping the spine around the inside leg but twisting/rotating it. So in the half pass right pictured here, the spine is curving around that inside leg but also twisting/rotating clockwise slightly, lifting the inside shoulder. HC said (at least, I interpreted her to say) that when a horse bends this way, people don't realize how much the inside shoulder has to lift, and as a rider you have to allow for this lift. I could write fifteen pages on what I learned today. I'll share what I can. If you get a chance to participate in a clinic with HC, don't let the chance slip by. I think it will change the way I work with my horse and what I expect from him and myself. I read everything I can get my hands on regarding Hillary Clayton. I find her presentations to be as clear and educational as you do ;o) She was part of a USDF Symposium maybe 15 years ago with Conrad Schumacher. The portion of her presentation was good dressage horse conformation and I believe Sue Blinks' fabulous FlimFlam was there, TOTALLY relaxed and enjoying being the "model horse." I envy your getting to see her in person and I'm glad your better natur prevailed this morning. Great and interesting information. Now I will be thinking of "bouncing organs" every time I ride. Clearly explains why ulcers are such a problem, though, that's for sure. There are some awesome videos on YouTube by JP Giacomini that reference the spinal rotation which you described for the half-pass. Giacomini also explains why loading the outside (rather than the inside) seat bone can help and allow the horse to lift the inside. That was super enlightening to me and I am so happy to hear another professional like Hilary Clayton describing the same lifting action.